Hola! 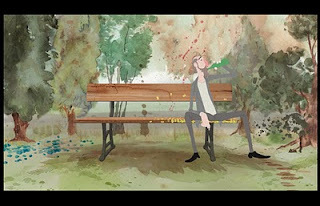 Drawing Inspiration is a short film directed by Wesley Louis and Tim McCourt. I know Wes and a handful of other people involved with this film from working on The Illusionist with them so I was happy to help out with a small bit of animation for it. The guys put a lot of hard work into it and I'm happy to say that it's turned out to be a very beautiful looking film so give it a watch and enjoy! There's also a blog with lots of cool art and pre production stuff so take a look. Hope you are keeping well? Whats you up too now? Hope all is good!! Would love to have a reunion some time..if not a reunion, im sure we'll be working together again some day... We're all one big traveling animation family really!! Lots a loves and thanks again! !